The Gambia Disability Impact Trust Fund (GDITF), a foundation founded by Dr Karamo N.M. Sonko, chairman of Heeno International and Mustapha Njie, CEO of TAF Africa Global, was officially launched on Wednesday 4th July 2018 at the Madiba Mall, Brufut heights. The foundation, which is the brainchild of two Gambian philanthropists, namely Dr Karamo N.M. Sonko and Mustapha Njie alias TAF, also saw various pledges by kind hearted Gambians shortly after its launch. 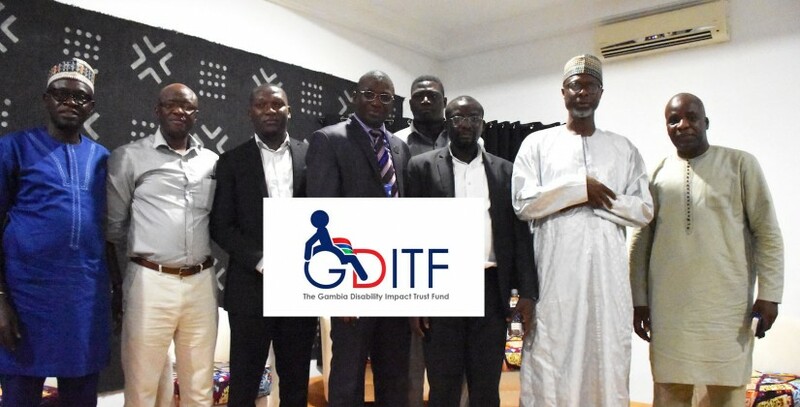 GDITF is designed to provide credit to persons with disabilities in a bid to engage them in gainful businesses, thereby alleviating poverty among the disabled people in The Gambia. At the launching ceremony, Mustapha Njie, chairman of the foundation, recalled that it all started a year ago, when he was invited to give a closing remark at a training, which attracted over 30 physically challenged individuals. According to Njie, at that training, he decided to donate a sum of D300, 000.00 to the participants to start-up a business that they were trained on. “In December at the TAF conference and on the issue of looking ways of how to develop the country, it was then Dr Karamo Sonko pledged a sum of D700, 000 into this fund” he explained. The foundation, he said, is funded by their personal funds, saying it is a way of giving back to the country. The award-winning entrepreneurs expressed optimism that the move will go beyond the borders of The Gambia. For his part, Dr Karamo Sonko Chairman of Heeno International, said according to UN statistics, there are currently over 650 million persons with disabilities throughout the world of which 400 million live in developing countries. “Although, no rigorous evidence exists on the financial inclusion of persons with disabilities in The Gambia, anecdotal evidence seems to suggest that persons with disabilities are excluded from access to financial services such as savings and credits” he stressed. Sonko noted that it was against this backdrop that they initiated GDITF during the TAF Conference in December, with an initial financial contribution of D1, 000, 000, by Heeno International and the TAF Africa Foundation. “The objective of the foundation is to provide credit to persons with disabilities in The Gambia, to alleviate poverty among the disabled in The Gambia; to showcase the entrepreneurial skills of the disabled in societies etc”. Speaking earlier, Muhammed Kurubally, a sitting magistrate at the Brikama Magistrates Court, who doubles as the president of The Gambia Federation for the Disable, said that the federation was established in 2011 to respect, protect and promote the rights and welfare of people living with disabilities. “People with disabilities should be treated equally with the able-bodied and we have to conquer with the fact that people with disabilities should be given education, employment and independent” he added. Kurubally indicated that already there are 10 disable organizations registered in The Gambia, highlighting that other disable organizations also exist, but some of these groups are yet to be registered with The Gambia Federation for the Disable. This federation, he went on, is established to ensure that people with disabilities in The Gambia are given economic independence and courage to be sent to school and acquire education. “When an individual is informed and trained I believe that there is no way that the individual would not succeed taking himself as a typical example (The Gambia’s first vision challenged magistrate). People wonder how I am able to take records of proceedings on my computer not knowing that I had undergone training to acquire such kind of skills to enable me to perform equally as the able bodied counterparts. “There are of a lot of success stories in The Gambia and in the world where the physically challenged, who are in different positions irrespective of their disabilities” he stated. “Mustapha Njie, who pledged D300, 00 and Dr. Karamo Sonko a sum of D700,000 are kind hearted Gambians, who had brilliant thoughts of the need to come up and lend a helping hand to the disables” He said.